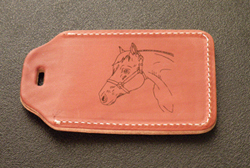 Leather luggage tag with laser engraved horse design. 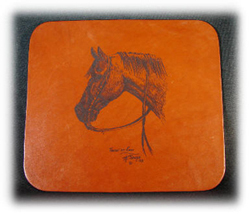 Design shown is the Quarter Horse Head image which can be found in our horse design items. The reverse side has a place to insert an address card. Oakbark leather snap key fob with engraved text. You can also add engraved horse designs or breed logos to these leather snap key fobs. Having a snap fobs makes it easier to keep track of your keys. Our leather key fobs are handcrafted in the USA. 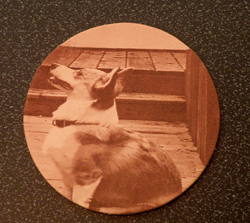 Leather coaster / disc with a custom engraved photo. You can also add engraved text to these coasters / disks. For more information on custom engraved photos please see our custom engraved image information page. Leather engraved bookmark. Engraved with custom text.